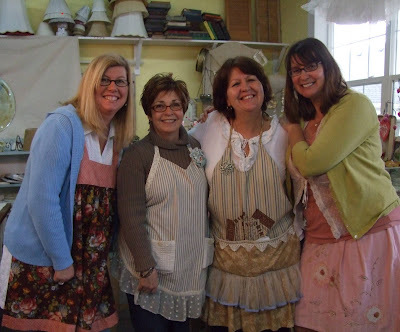 It seems that I am the last to post about the fabulous time we had at the blog party on Saturday. Unfortunately half way through the party, my camera battery died so you will just have to check out more pics at here, or here or here. Here we are the four of us. Me, Martha, Joy and Isabel posing before the party started. Joy had outdone herself and the house looked fabulous. 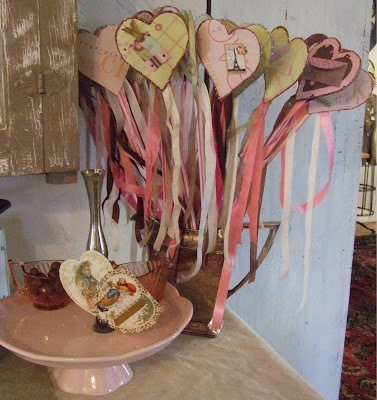 She had some adorable Valentine's touches here and there. 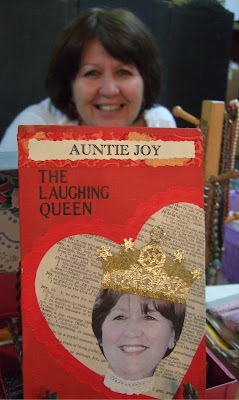 Martha made the cutest card for Joy out of an old book cover. So appropriate I think. 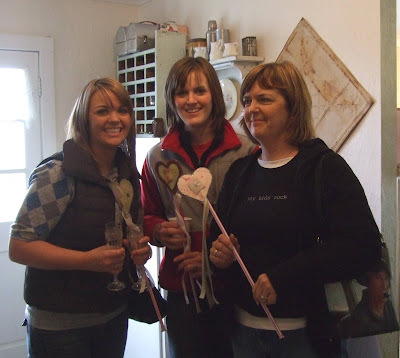 Pam stopped by with her lovely daughters Mindy and Stacey. It was also great to see Joe and Jermone, Cindy, Julie and Christa, Timi and her Hubs, Silvie and her adorable daughter, Cecilia. Joy's sister, Tony, Jori, Michelle and Betty came too. It was so fun to see everyone and the crafting was a huge hit. I was so impressed with how lovely everyone's crowns turned out. 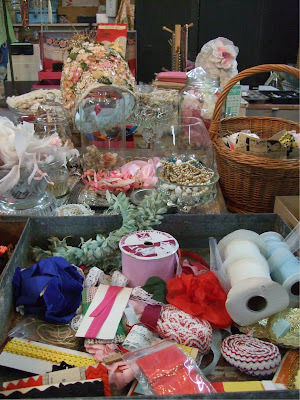 Joy had a huge table full of vintage supplies for everyone to use. 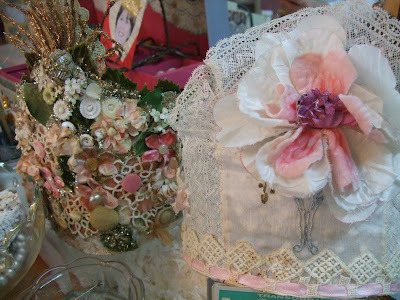 Here are some pictures of crowns that Joy and Martha had made previously. Just gorgeous! We had a lot of local people who weren't able to make it, so I think we will just have to do this again sometime. It really was an incredible day and so lovely to hang out with friends old and new. I had the best time Saturday and it was so nice to visit with you. how fun for all of you to get together! Thanks for sharing with us! Please visit my blog for a little give away! Oh, this looks like it was so much fun! I am sad I missed seeing you girls again! My firend and I are coming down to portland the last week of february and spending the weekend. I can't wait to go to montecello's! Got any suggestions for a cute b and b or inn to stay in in the sellwood area or close by? 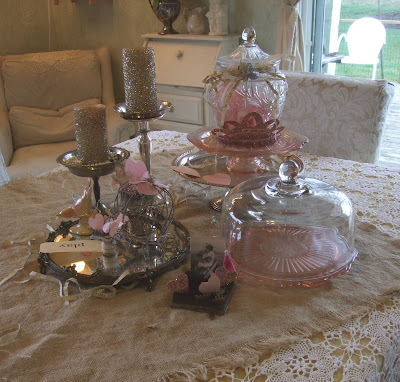 Loved seeing the get together on your blog, thanks for sharing lisa! Oh, it looks like you gals had a wonderful time! Sorry we couldn't chat today! Hope you found something wonderful at Montis! 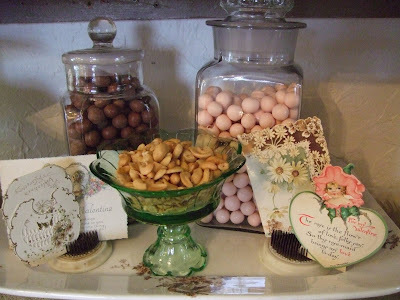 I just wanted to stop by and thank you for co-hosting the wonderful blog party. I was wonderful to meet all of you wonderful ladies. I loved how my crown turned out. I would love to do it again!